Mr Cain King, from CKDS Architecture, has given a progress report on several of the key development sites in and around Gosford City. He said the Bonython Tower development in Mann St, Gosford, was still running to plan. 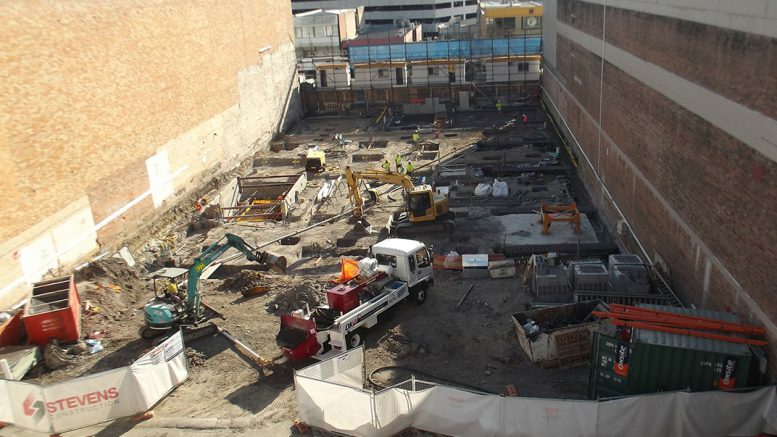 “The water table is very close to the surface there, so we knew there would need to be pumping, but we are getting ready to pour the piers and lay the ground floor slab,” Mr King said. “The developer is also talking to Ausgrid about the power supply for the site,” he said. Pre-sales of the residential apartments in Bonython have been completed and the developer is now actively selling the commercial suites, Mr King said. With regard to the Waterside triple towers development, and as reported elsewhere in this paper, demolition on the site at 50 to 70 Mann St and 114 Georgiana Terrace has been delayed due to some of the buildings being used as a squat by the city’s homeless. The $234.36 million triple towers will include mixed use commercial, residential shop top housing, a cinema, hotel and tavern. Mr King said the developer, New Hong Kong Macau Australia Pty Ltd, had installed 24-hour security at the site so demolition work can commence. The new demolition program will commence within six to eight weeks. A section 96 application will then be made to put staging in place for the project and ensure the developer can comply with consent conditions. The developer is looking to commence off-the-plan sales in early 2018 and commence construction by the end of 2018, Mr King said. Elsewhere, the Merindah apartment building, which is located behind the Telstra building in Mann St (across the road from the ATO and new finance building) will also move ahead soon, Mr King said. “They have completed their off-the-plan sales and they have got finance, so by the end of September, early site works will commence,” Mr King said. He said 85 per cent of the units, which will have a street address of 92 Henry Parry Drive, have been sold off the plan. The Hill Albany Residential Development at 8-10 Duke St, Point Frederick, is another of the developments designed by Mr King’s architectural firm. The development consists of three residential apartment buildings that will contain 101 units (reduced from 111). Designs have been changed and an additional residential lot included. The amended designs have been sent back to Council for assessment. It will then be referred to the Joint Regional Planning Panel. The mix of units will be 20 one bedroom units, 42 two-bedroom units, 39 with three bedrooms, two levels of basement car parking with 150 car spaces, seven motorcycle and 42 bike racks, 16 units will be adaptable.